The Vermont Pillow was an idea from scrap, literally. While visiting an upholsterer's workroom one day, Teri spied some cow hide remnants and took them back to her studio. She brainstormed and created the Vermont pillow by marrying linen with the hide. We introduced the pillows at a local holiday boutique and sold out instantly. We are excited about new designs and color stories. To order a pillow or see samples contact us at 802.249.6122 or teri@terimaherinteriors.com. "I was originally drawn to them visually. However, it was when I picked one up that I knew I had to have one! The combination of textures is wonderful. The fabric is high quality and the hide cut out of Vermont is fantastic. Love the neutral palette as well. Feels unique and of high craftsmanship." 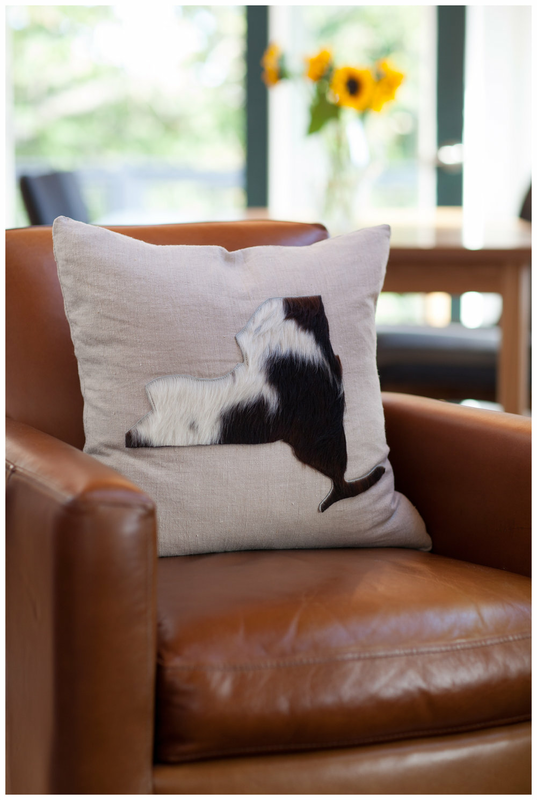 "It is hard to believe that one could capture the essence of Vermont in a pillow, but Teri did! The simplicity, the texture, the warm colors, the "ode to dairy" - it was a must-have for our home. We now have a similar pillow for every state we've lived in!" New designs and colors coming soon!! !